Cross-training has been talked about almost across the board with this new Huskers staff; wideouts are playing at tailback, tailbacks at wideout, tight ends out wide, safeties at corner, defensive tackles at defensive end and right guards at center. It’s the “we’re going to play the best guys, period,” approach and in the case of the offensive line, its shuffled around two of last year’s starters: Tanner Farmer and Brenden Jaimes. Let’s start with Farmer, a senior and last year’s starting right guard, who has exclusively been a guard since, well, he can’t really remember an exact time. “I hadn’t played center since a long time ago,” he said when asked, but he’s learning in the absence of Cole Conrad and Michael Decker — last year’s starters at the position, both rehabbing injuries. One of the bigger adjustments is understanding what he has to do pre-snap. Last year, he says, guys knew the calls but the center was much more specialized. Now, coach Greg Austin is creating a group where just about anyone can technically line up at center. Farmer has been completely fine moving one spot to his left, he says all he’s ever wanted to do is play offensive line. Despite being an Illinois native, he’s also as big a Nebraska boy as you’ll find. This is the same guy that has flaming Nebraska logos on both doors, the tailgate and the hood of his Ford pickup truck; if Austin asks him to do something, he’s going to do it. As the practices wind down and the clock inches closer to Saturday’s kick-off, Austin, along with every other position coach, is starting to split up the reps in practice a little less evenly and a little more on performance. Redshirt freshman Hunter Miller was getting a good share of first-team reps at center but Farmer says he’s starting to play more and more in the middle. He was quick to point out that nothing is set in stone, but there are a couple spots on the offensive line that fans can feel pretty confident about penciling in right now. It would be a shock if Jerald Foster, another senior, wasn’t the left guard. If Conrad’s injury or Decker’s linger much longer, Farmer might have a leg up on that spot. And then there’s Jaimes at left tackle. When asked if last year’s starter at right tackle was more comfortable now over on the left, Jaimes didn’t even wait for the question to finish. Jaimes told Austin right away he felt better on the left than the right. Last season saw Jaimes emerge on the line after a pair of injuries on the depth chart ahead of him and there were times it looked like he was the best guy they had for the spot, but Farmer said there were others where Jaimes would show his youth. Jaimes says he’s up 10 pounds of good weight with the goal of hitting 300 by August. 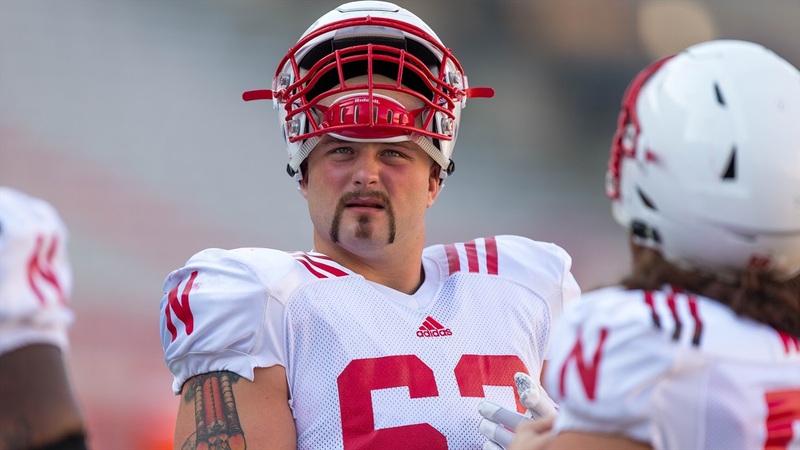 In this scheme, one that head coach Scott Frost and offensive coordinator Troy Walters have both said is offensive-line friendly, linemen need to be a little more athletic and operate a little more in the open field. “It’s a little bit different,” Jaimes said, “but at the end of the day it’s just football and you’ve got to play.